REPUBLICAN FRONTRUNNER FOR president and brash billionaire Donald Trump pledged loyalty to the Republican Party last night and ruled out a third-party tilt for the 2016 election. He made the announcement in the lobby of his New York headquarters as he shot to an even greater lead with 30 percent of the Republican-leaning vote, according to the latest opinion poll by Monmouth University. “I will be totally pledging my allegiance to the Republican Party and the conservative principles for which it stands,” the real estate tycoon told a news conference at Trump Tower. It marks an about-turn for the former reality TV star, 69, who kicked off the first Republican debate in Ohio last month by refusing to rule out a third-party run. His say-it-how-it-is attitude, business acumen and charisma have made him a rock star in the eyes of ordinary Republican voters but his refusal to dismiss an independent run had confounded party grandees. The lobby of Trump Tower was crammed to bursting with reporters, employees, loyalists and members of the public craning for a sight of the man known to millions as perhaps America’s most outspoken billionaire. There had been widespread Republican fears that a third-party run could split the vote and hand the Democrats – and frontrunner Hillary Clinton – a free ticket into the White House. Trump said he changed his mind because of his soaring poll figures and said that him winning the Republican ticket was the “absolute best way” to win the White House and beat the Democrats. In a sign of his growing stature, he pointed out it was Republican National Committee chairman Reince Priebus who had brought the pledge to Trump to sign, and not he who had gone calling. He lauded his billions and financial independence as a unique buying point for the electorate, saying his alone was a self-funded campaign. By contrast his chief rivals — Clinton and perceived establishment choice Jeb Bush for the Republicans — were in the pockets of lobbyists, he said. “I will tell you this. Nobody’s putting up millions of dollars for me. I’m putting up my own money,” he said to applause. Some commentators suggest securing Trump’s loyalty may come at a heavy price for the Republicans if it antagonizes those enraged by his more controversial opinions, particularly his insults towards illegal immigrants. In a statement, Priebus hailed the Republican Party spirit. I’m proud to announce that in a sign of party unity all 17 Republican presidential candidates have pledged to support our eventual nominee,” said Priebus. Trump denies that he is anti-immigrant, only anti-illegal immigration. He suggested he wanted to do more to help talented foreigners, such as tech entrepreneurs, engineers, physicists and the best performing foreign students stay in the country and acquire citizenship. In a final flourish, he closed out the press conference by introducing the speaker of Indonesia’s parliament, as his personal guest. He also repeated his ardor for boundary-pushing rapper Kanye West. “I’ll never say bad about him. You know why? He loves Trump,” he said. “I love him. Now, maybe in a few years I’ll have to run against him,” he said. The musician stole headlines at the MTV Video Music Awards on Sunday by announcing that he had decided to run for president in 2020. “I only hit people when they hit me,” said Trump. Email “He's taken the pledge: Donald Trump vows not to run as an independent”. 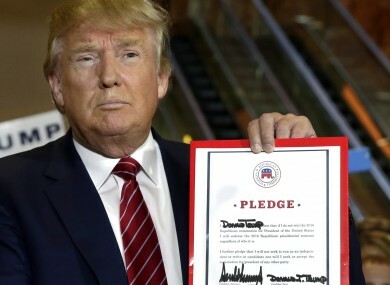 Feedback on “He's taken the pledge: Donald Trump vows not to run as an independent”.